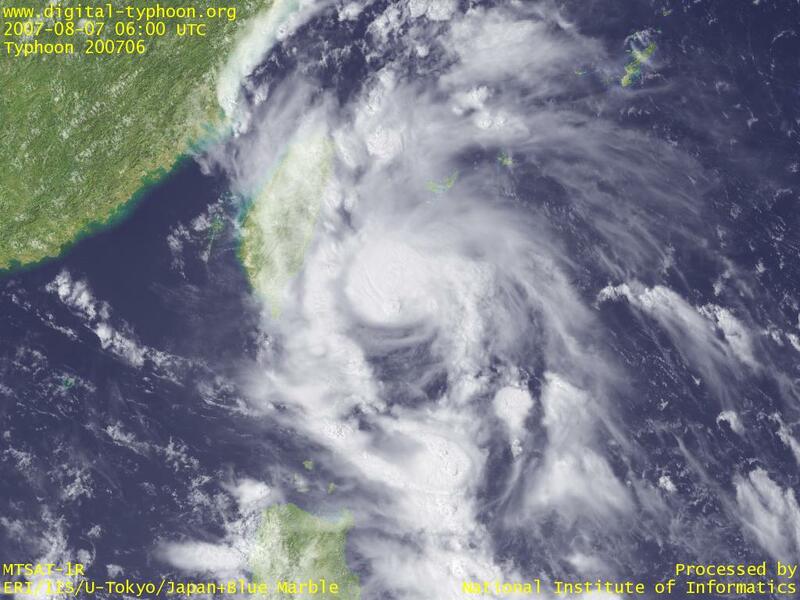 Typhoon PABUK passed the southern tip of Taiwan, and crossed South China Sea to Guangdong Province and Hong Kong. And it further moved westward near Hainan Island, weakened to a tropical depression, then moved reversely to eastward along the coast of South China Sea and East China Sea along China mainland, and is now moving in Yellow Sea. The typhoon was not so strong in intensity, but it came with well-developed clouds, which brought heavy rains for many places in China from Guangdong Province to Shangdong Province. More than 1.4 million people suffered from heavy rainfall, but no casualties have been reported. According to Central Meteorological Office, Leizhou Peninsula recorded a heavy rain once in 200 years, which recorded 1 hour precipitation of 213mm, 24-hour precipitation of 739mm, and the total precipitation of 935mm. In comparison to past heavy rainfall data in Japan (the record from the 30-year observation of AMeDAS), the maximum one hour precipitation of 153mm was recorded at Katori in Chiba Prefecture and at Nagauradake in Nagasaki Prefecture, and one hour precipitation of 187mm, recorded on July 1982 in Nagasaki Prefecture, is thought to be the largest in Japan, but one hour precipitation of 200mm has never been recorded in Japan. Imagine how heavy the short-term rainfall is in the tropics. If you examine past heavy rainfall data in Japan for 24-hour precipitation, however, you may notice that the observation of 979mm was recorded at Shigeto, Kochi Prefectore, in 1998, and the comparable level of precipitation has been recorded several times in Japan. Typhoon PABUK is now in south of Sakishima Islands, and Yaeyama Islands are now inside of the area of 30kt winds or more. Part of Taiwan is also contained in the area of 30kt winds or more, and the typhoon is expected to make landfall at the southeast of Taiwan. The image below shows that this typhoon is more like a ball of clouds than a spiral of clouds, and the intensity is not so strong, but also note that the clouds at the center are well developed, which may lead to heavy rainfall. Typhoon PABUK is moving westward in south of Sakishima Islands, and the area of 30-kt wind will graze Yaeyama Islands. It seems the cloud shape of the typhoon is not good, so the forecast says that the typhoon will make landfall at Taiwan before intensification. Typhoon PABUK was formed in east of Philippines. The clouds are still not concentrated in the center, but it is forecast to intensify as it moves westward, so Okinawa may be affected by the typhoon in a few days.